This book is half and half for me. I absolutely loved the skewering of Hollywood and its denizens. 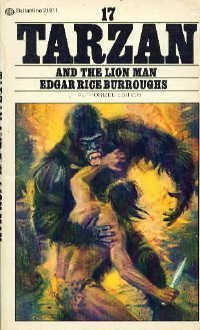 Since I've hated almost every Tarzan movie ever made I can sympathize with Edgar Rice Burroughs and his frustration with their ham-fisted treatment of his most famous character. Strangely, he especially hated the way they portrayed Jane as a brunette when she was supposed to be a blonde. 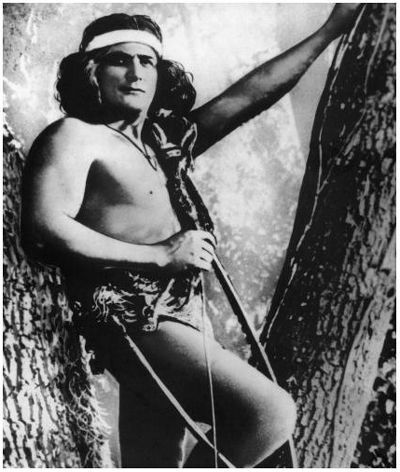 I would have thought he would be a lot more upset with the casting of short, stumpy, homely Elmo Lincoln as Tarzan. 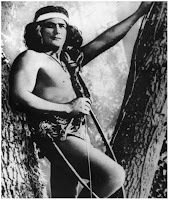 He looks like he should have been playing Gunner from Tarzan Triumphant rather than Tarzan. Better yet, he could have played one of the apes. Ugh. Anyway, ERB was so annoyed with the bad casting and writing for the movies that he took on Hollywood in this book, sending a movie team to the jungle to film on location instead of on a back lot somewhere. Instead of an ape man, this movie features a lion man, a Tarzan clone who was raised by the king of beasts instead of apes. Of course everything goes wrong. I loved all of that, although it's darker than I remember from when I read this back in the 70s. I must have been a bloodthirsty teen because I never minded all of the killing back then. The book takes a bizarre turn when the movie people get mixed up with a tribe of uplifted gorillas who have been genetically modified and given Renaissance names and identities. King Henry VIII is especially silly with his many wives, all named for the real Henry's serial harem. Of course the science is nonsense, but it's ERB, that's going to be a given. I had a bigger problem with the girls who are practically twins and yet another actor who looks so much like Tarzan that his friends mistake Tarzan for him. Seriously, does everyone but Tarzan need glasses in these books? I could have done without that bit of nonsense, it didn't add anything to the book and wasn't necessary for the plot. I think ERB was just having fun with it. I barely remember the action with the gorillas, there was a bunch of running around getting captured and escaping and getting rescued by Tarzan, it wasn't very memorable. It might have been more interesting if I hadn't already read much the same stuff in the last few books. It really gets funny and over-the-top silly when John Clayton makes his way to Hollywood to see how it works for himself. He auditions for the role of Tarzan and is rejected for not being the right type. You could see ERB's eyes twinkling when he wrote that part. For the Hollywood stuff it's a solid 4 to 5 stars but the gorillas drag it down. I'll give it a respectable 3 1/2 stars rounded up, as always, for the Tarzan factor. I wouldn't start your Tarzan journey here, but it's worth a read.